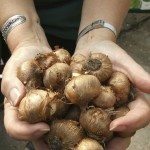 Taking care of crocus bulb containers is easy, as all you really need to know is how to grow crocus plants from a bulb or actually, a corm, which is a bulb-like structure. Crocuses are not only great showstoppers in the garden, but they can make wonderful houseplants too. Crocuses are great for adding early color indoors with window boxes, planters or other containers. Learn how you can do this with the following potted crocus information. Whichever type of container you choose, adequate drainage is important. They grow well in many types of soil; however, you may want to add extra peat to the soil mix at first. Place crocuses in a container with their tips slightly sticking up from the soil. Water the bulbs thoroughly and then place the pot in a dark place for several months, as these bulbs generally require a 12 to 15 week cold period. The temperature should stay between 35 to 45 F. (1-7 C.). Once the bulbs begin to sprout, move the pot to a brighter location and provide warmer indoor temperatures, like that of at least 50 or 60 F. (10-16 C.). Maintain watering, but let the surface become dry to the touch before watering. Take care not to overwater crocus or their corms will rot. When growing crocus indoors, be sure to provide at least four to six hours of sunlight. Crocuses need plenty of sun to create those spectacular blooms. Once blooming has ceased, the crocus leaves should be left alone to dry naturally, as this process is imperative for healthy plant production. Crocus self-multiplies each year and new plants can be formed through seeds or division; however, division of its offsets seems to be the most effective propagation method. Plants from seeds, which can be collected from the plants once the blooms are dry, may not develop flowers for at least two or three years. Keep in mind that potted crocus may not always produce flowers each year either; therefore, you may have to start the process over again when growing crocus indoors. Crocuses can be easily propagated by dividing the corms in late summer. Simply dig them out of the pot, separate and replant them. You can grow many varieties of crocus in containers, from spring-flowering varieties to fall-flowering species. Growing crocus indoors and taking care of crocus bulb containers is easy, and this hardy plant will provide nonstop color just when you need it most.